Claim your Free Attachment with any Kenwood Chef or kMix. When you buy a new Kärcher K 5 or K 7 Pressure Washer with Full Control Plus this March, April and May! *Receive 120 coffee capsules worth over £60 with any purchase of a Nespresso Vertuo Coffee Machine. *This is a Nespresso customer redemption promotion, not to be fulfilled by EPE. Get £50 Web Credit from Dolce Gusto, on machines purchased between 28th September 2017 and the 31st May 2018. Find The Golden Eggs To Be In For A Chance To Win! Free Meat Grinder Attachment worth £60.00 when you purchase a Kenwood Chef. Varta Buy 2 Get 1 Free !! Karcher Buy 4 WD2’s Get 1 Free!! When you buy 4 Karcher WD2 Wet & Dry Vacuums Get1 Free !! Free Ice Cream Maker Attachment worth £60.00 when you purchase a Kenwood Chef. Free gifts redeemable from Delonghi on purchases between Saturday 25th March – Sunday 14th May. To redeem the promotion you must register your machine at www.seriousaboutcoffee.com/thecoffeeclub. CLAIM £100 WORTH OF FREE ACCESSORIES! Claim £100 worth of free accessories from Karcher when you spend over £200 on a Karcher pressure washer. TAKE ADVANTAGE OF OUR FANTASTIC OFFERS AND CALL NOW! Claim your free Window Vac Pole now from Karcher! Visit the web link below to claim today! Free TomTom Spark with every purchase! Please ask a sales representative for details. 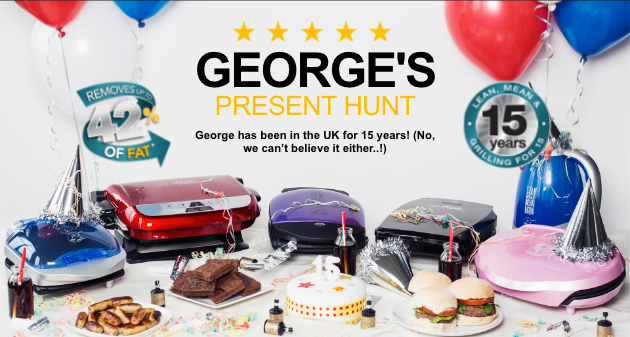 George Foreman – Grilling for 15 years! George Foreman – Grilling for 15 years! HELP HIM CELEBRATE! When you buy a Nespresso machine, you become a member of the Nespresso Club. As a Club Member you will gain access to a number of privileges: convenient ordering, free delivery options, personalised services and an environment in which to share your passion for coffee. To apply for this offer, you must register with the Nespresso Club, you can apply online at nespresso.com/UKpromotion. All applications must be received by no later than midnight on 31st July 2016. Buy a Delonghi Dedica in Silver (EC680.M) and receive a free KG89 Stainless Steel burr grinder worth £54.99 in pack. Buy 5 of an individual line and receive another of the same product FREE! Available on the SC2, MV2, MV3P or K65 Plus. Watch as your culinary masterpiece take shape in this stylish glass bowl accessory. Buy 12 Irons of each of the above models and receive a free shipper. 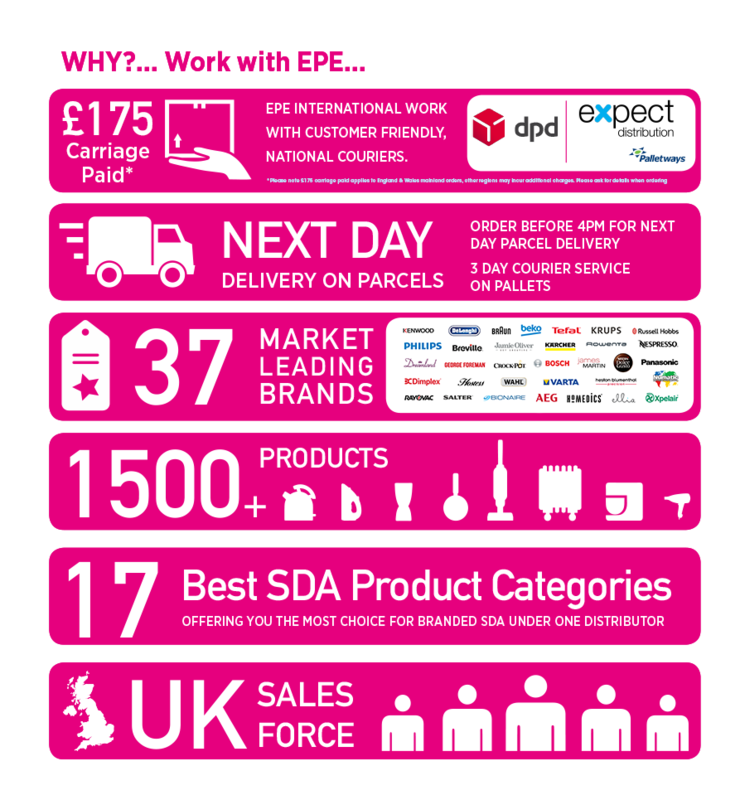 The EPE Trade Site has exclusive special offers available nowhere else. EPE customers are able to login to the trade site to check stock, prices and place orders, as well as download Hi-Res images of all the products. To be able to use the Trade Site request your log-in details now. EPE International are delighted to announce our Black Friday Deals for 2014. For those who aren’t aware, Black Friday has long been a big shopping day in the USA. In fact it’s the busiest shopping day of the year over there for two key reasons. Firstly, it’s the first Friday after Thanksgiving and lots of people have the day off work, and thus secondly, retailers choose this day of merriment to offer their best bargains of the year. The result is often newsreels full of CCTV footage of desperate shoppers pulling each other’s hair to get to the impossibly priced small kitchen appliances, heaters and pressure washers. In the UK, businesses have seen the benefit of the event and 2014 is expected to be the biggest British Black Friday yet. Nearly three-quarters of UK consumers have heard of Black Friday according to a study from eDigitalResearch. The challenge for retailers is to capitalize on the opportunity as more and more shoppers look to grab a bargain. You’ll have the chance to pick up and provide bargains on all sorts of small domestic appliances, and guess what, we’ll be on hand to help you find them! Call Louise from our team for information on the available deals on 0844 800 8055. Once you have purchased your new Kärcher “Window Vac”, you will need to follow the simple claim process below to receive your cashback. To enable us to complete your claim, we will need to see supporting documentation, which will need to be supplied as a hard copy. 1. Please read the terms and conditions and ensure that you have understood them fully before applying to make a claim. 2. Buy a promotional pack of one of the following Kärcher Window Vacs (WV50, WV55, WV60, WV70, WV75) between 01/10/14 and 31/10/14. 4. Complete the online form. 5. After submitting your details you will see a confirmation page. 6. Print out the confirmation page complete with your reference number. 7. Post your print out, till receipt (showing purchase price and date) and the barcode cut from the packaging to Kärcher Window Vac Cashback, PO Box 1079, Hemel Hempstead, HP1 1GY. 8. You will receive your cashback cheque (including 2nd class postage refund) within 28 days. •	Maximum of two applications per household only. •	If you experience problems and/or are unable to complete the online claim form, please email our customer care team at queries@karchercashback.co.uk or ring our customer care line on 0844 561 8858. Once you have purchased your A Modo Mio machine, follow the six golden rules below and you will receive your cash back within 28 days of receipt of application form THE GOLDEN RULES: • This promotion is valid when you purchase an A Modo Mio machine between 12th November 2012 and 13th January 2013. • You must send the original serial nr. barcode, cut from the machine packaging. • You must send a photocopy receipt (showing machine model, amount and date of purchase). ** • Complete the application form. • Detach the form and post it to: Lavazza A Modo Mio Offer, P.O. BOX 716, High Wycombe, HP11 1XT making sure you enclose the requested proof of purchase. • Make sure it reaches us by the 13th February 2013.